Change At Federal Election Agency Muddles Kansas Voter Registration Laws : The Two-Way The state requires its residents to prove their citizenship when registering to vote, but a federal agency fought the law in court. It now appears to have changed positions. Voters cast ballots in November 2014 at Lake Shawnee park in Topeka, Kan.
Get ready voters: It's time to be confused. Even as Americans start heading to the polls for this year's presidential primaries, laws remain in flux in a number of states — including North Carolina and Texas, where voter ID requirements are being challenged in court. 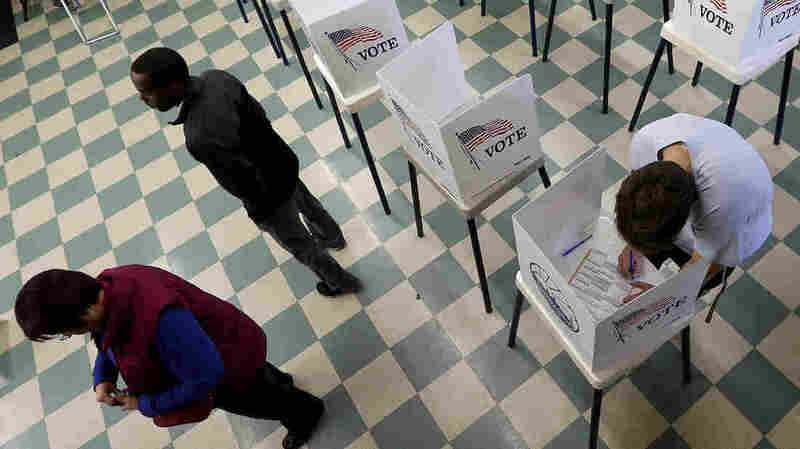 Now the U.S. Election Assistance Commission, the federal agency charged with helping to improve the running of elections, has added to the confusion. And unlike most voter ID conflicts — which involve showing identification at the polls — this comes earlier in the process, when residents are first registering to vote. The EAC has been in a long legal battle with Kansas regarding the state's requirement that residents show proof of citizenship when they register to vote — even if they use a federal registration form, administered by the EAC. The federal form, which can be used throughout the United States as an alternative to local voter registration forms, requires individuals to swear that they are citizens. It does not require a birth certificate or other document as proof. Just last month, a state judge ruled that Kansas Secretary of State Kris Kobach could not enforce the proof-of-citizenship requirement for those who use the federal form. Kobach argued that those who don't provide such proof shouldn't be allowed to vote in Kansas' state and local elections. But late last week, the EAC's new executive director, Brian Newby — a former county elections official in Kansas — sent a letter to the state saying that the agency had updated the instructions on filling out that federal form to include the proof-of-citizenship requirement for Kansas residents. This came after previous EAC executive directors had refused to add the requirement. That led one of the EAC's three commissioners, Thomas Hicks — the only Democratic appointee — to issue a highly unusual statement Tuesday calling for Newby's letter to be withdrawn. He said it "contradicts policy and precedent previously established by this commission," and he called on the commission to review the matter in a public forum. For his part, Newby told NPR that he believes it's within his power to make changes to the instructions that accompany the federal voter registration form, in response to a state's request. But he said that "any interested party" can ask the commission to review his decision. "The decision isn't final," he said. "This started a process." That process is likely to continue for months, far past the state's March 5 primary. Kobach's push to require proof of citizenship is part of a larger, national fight over adding new voting restrictions, in what sponsors claim is an effort to prevent voter fraud. Opponents say it's an effort to suppress voting rights. Among the many questions still to be answered: What, if anything, will the full commission do? What will happen with the legal battle? (Kobach says he will continue to fight.) And perhaps most important — if you are a resident of Kansas who registers to vote using the federal form and doesn't show proof of citizenship, will your vote be counted in state and local elections, or not?